Directions? Round the back of Slieve League and the quiet majesty of some of Europe’s tallest sea cliffs would put you in sniffing distance. If you hit Gleann you’d have gone too far, but have a look at the church with St. Patrick and the donkey. The library’s across the bog lake, opposite the decks of carved and drying peat. I'm thinking the lough is Lake Agh, it would be a cool place to spend a night. 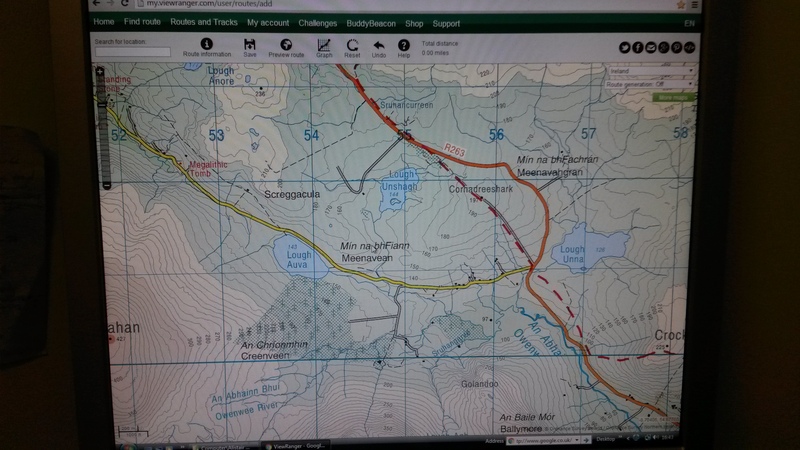 I quite like Lough Unshagh for it, as there's a couple of buildings on the western shore of the lake, whereas the historic maps (available on OSI.ie) do not show any buildings adjacent to Lough Agh or Lough Auva. However, a quick search of Lough Unshagh shows two ruined cottages unless the photo is more out of date than the blog post. Another candidate is at Lough Auva again, there's at least three ruined cottages (clearly visible in Bing Maps which is better resolution) at the far end of the forest from the lake. However if the bothy was actually in the forest I think that would be noted in the blog post. If you look on Google Streets at the RC Church in Glencolumbcille there's a horse or a donkey with St Patrick above the front door. Auva looks promising. I think that prominence in the middle distance here matches up to one of the photos on the website and the tree line goes right down to the edge of the lough. I hadn't seen the photos, wish I had! Clears it up as I was thinking of a traditional bothy that is a done up old building just about made fit for human habitation. I'd planned to go out that way this Spring, I was going to base myself at DerryLaghan just on the other side of Teelin Bay and was hoping to explore these valleys, lakes, cliffs, little bays etc when I go there. If you're going, take a pair of wellies with you - the place is completely saturated! Congratulations! Did you stay in it or is it too far gone for that? The door (as ye can see) has been ripped off it and the inside is damp, wet and mouldy. Definitely not somewhere I would want to be staying that's for sure. But I'd recommend going and finding it yourself, loads of messages wrote on the walls and a diary with comments in it. next people who go up, take a screwdriver and put that door back on. I hope it's still there for Nialls Birthday. In face, you know when the party is - maybe we should gate crash! Might take more than a screwdriver to get that back on. Hopefully get a chance to check myself at some stage.